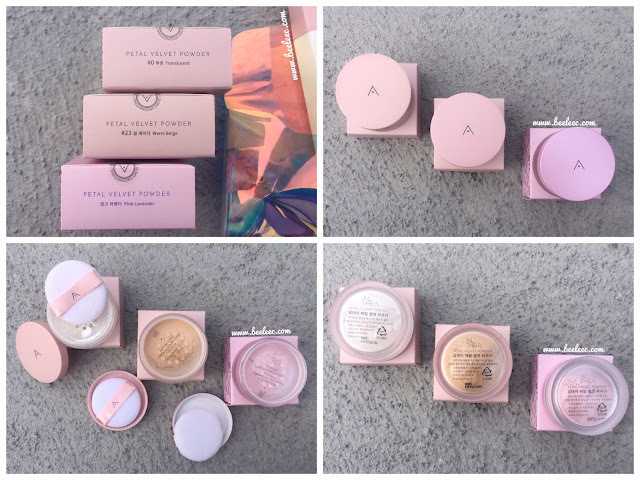 This is the Althea Sunaway Kit that I have received. 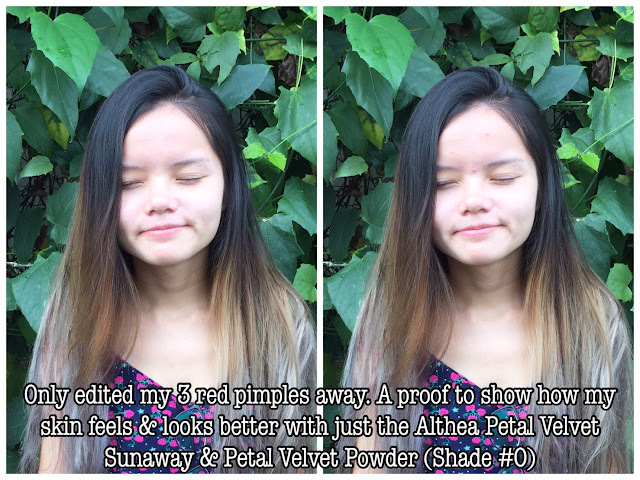 The star today is the Sunaway sunscreen and best to be paired with the Althea Petal Velvet Powder (in 3 shades!). Long-wearing & strong protection for daily use! 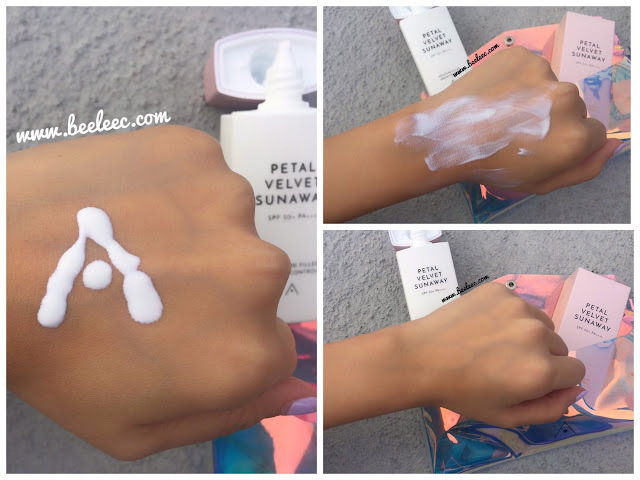 Moisturizing sunscreen with NO with cast, NO stickiness and sebum controlling! 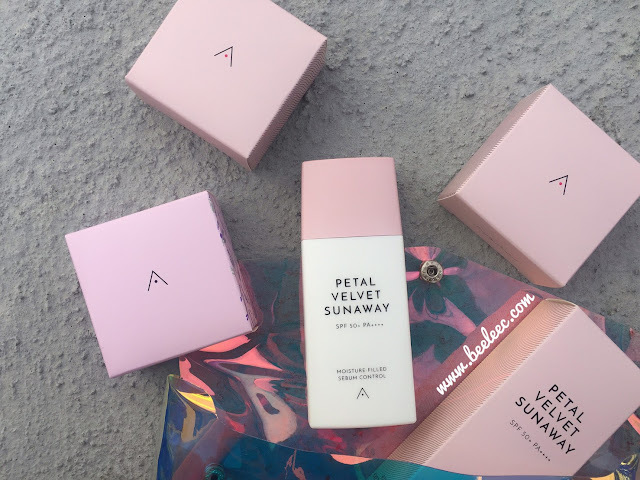 For a soft, velvety finish and petal-like skin. The cool holographic pouch came with the Sunaway kit. I love love love it! 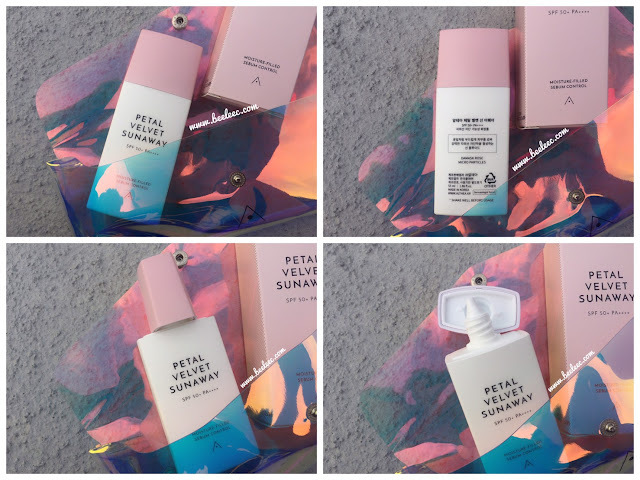 Its a non-chemical sunscreen, thus suitable for all skin types, even the sensitive! It also contains HA that the dry skin type would love! It is an advanced non-chemical formula with a light, fluid texture to protect the skin from both UVA and UVB rays. It also will not leave a white cast like the many other sunscreens you've used before because of its advanced non-chemical formula! *non-chemical means that it is gentle on sensitive skin as it does not contain chemical ingredients. The micro-powder barrier technology absorbs excess sebum production thus give a velvety finish. The moisturizing formula also keeps skin hydrated throughout the day. (+) Damask Rose - helps moisturize and smoothen skin. Damask Rose has a natural nanomolecular composition that is rich in vitamins to penetrate deep into the skin, soothing sensitive skin and strengthen it for a radiant glow. (+) Caprylyl Glycol, Butylene Glycol, and Ethylhexylglycerin - Good moisturizing elements. (-) Zinc Oxide, Stearic Acid - It can potentially block pores. Apply a generous layer evenly onto the face in morning or before sun exposure. 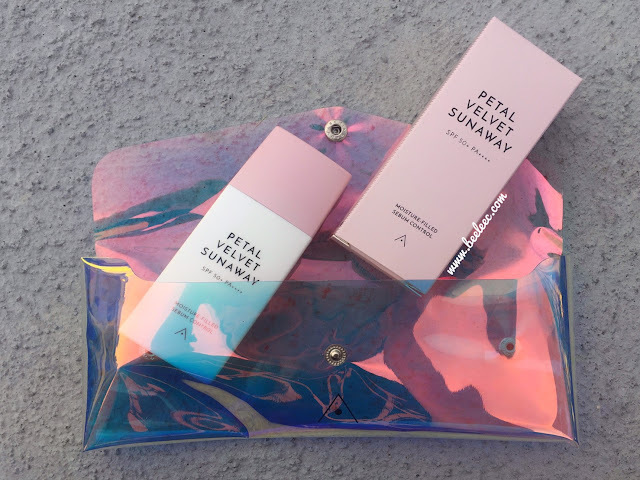 Packaging: Clean, sleek, and dreamy packaging. I like the square base as it helps with better grip. Texture: After shaking, I assumed the texture would be thicker. However, it was still slightly runny in a white milky texture. Do not drip it on dark clothes as it'll leave a stain. No worries tho, it can be washed away. Scent: It wasn't fully Damask Rose scent that I was looking forward to however it was quite pleasant and refreshing. It somehow reminds me of some lemongrass-y scent. 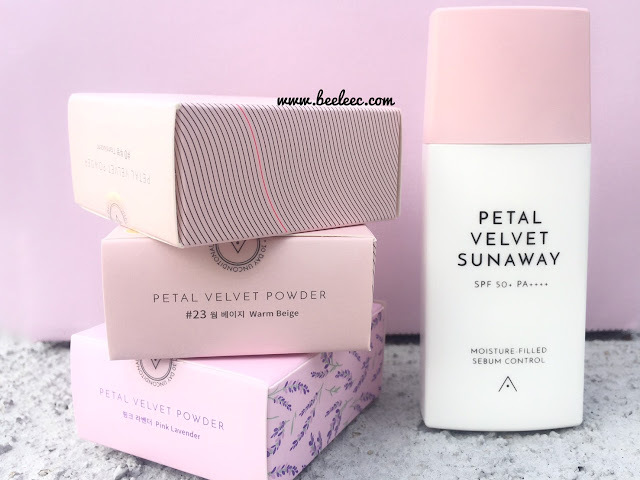 The scent does not bother me much as it goes away after awhile or probably the floral scent of the Petal Velvet Powder has covered its scent ^^. Effectiveness: It does what it claims to and I like that there is no white cast at all. When I sweat, there is no 'white' sweat like the other sunscreens I have used XD My skin can stay matte for the whole day out! As a dry-combination skin user, I highly avoid mattifying products. 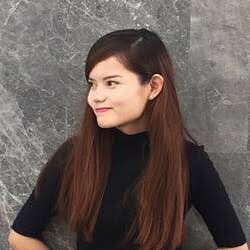 My skin feels fine if I wear the sunscreen and powder alone but never okay if under a slightly mattifying foundation. I find wearing the sunscreen alone will make my skin look dewy and healthy. 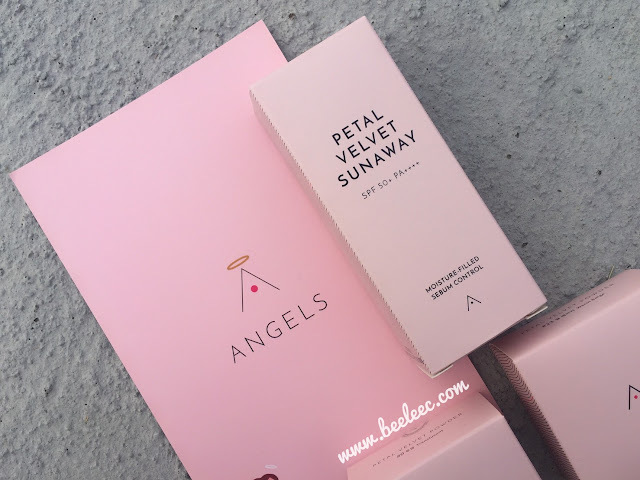 However upon application there is the slightly sticky/velvety texture (from loads of user reviews they claim that it dries fast but your girls is just impatient) and I quickly puffed the powder to instantly smoothen and mattify my skin. For situations where I do use the Sunaway, Powder and makeup, I only powder my nose and under eye area for a quick 10 seconds. Throughout the usage period, there is no sensitivity or whatsoever so I highly encourage everyone to give the Althea Petal Velvet Sunaway a try! The left and right is the same pic. Just that I have edited away my pimples in the left pic to show you that it'd be great when your skin needs the slightest enhancement to looking flawless on better skin days.